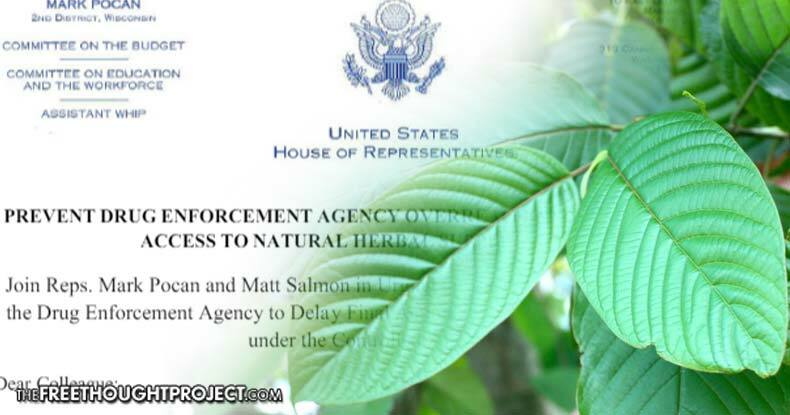 Washington, D.C. – As the Free Thought Project reported earlier this month, the U.S. Drug Enforcement Agency (DEA) announced they will ban the popular pain relief supplement kratom by placing it on the Schedule 1 list, which denotes “no currently accepted medical use and a high potential for abuse” – the most restrictive classification under the federal Controlled Substances Act. However, the tyranny of the DEA is now being questioned by Congress. According to US News, Reps. Mark Pocan, D-Wis., and Matt Salmon, R-Ariz., recruited 45 signers in the House of Representatives on Friday afternoon for two letters, which will be sent Monday to Chuck Rosenberg, acting administrator of the Drug Enforcement Administration, and Office of Management and Budget Director Shaun Donovan. The DEA’s tyrannical move to ban this amazing and beneficial plant comes on the heels of peer-reviewed research showing that kratom could potentially be a much safer alternative to deadly prescription opioids. According to US News, preliminary scientific analysis shows that kratom, despite DEA concern about safety and anecdotal reports about dependence potential, could offer substantial harm reduction — particularly as accidental overdoses of opioids including legal painkillers and illegal drugs like heroin killed more than 28,000 in 2014 alone. Countless patients currently using kratom to treat their heroin, alcohol, and cocaine addictions, fibromyalgia patients, and people with arthritis and cancer would no longer be able to use this plant — and instead be forced back into dangerous pharmaceuticals or the black market. “I feel a lot of hope because the amount of congresspeople who are paying attention to this issue and the media and the public are really weighing in our favor – it’s finally coming to light who the average kratom consumer is,” Susan Ash, founder of the American Kratom Association consumer group, which organized a Sept. 13 protest at the White House, said to US News. The DEA claims that 15 deaths were attributed to kratom last month. And, if this were true it is still far safer than alcohol, tobacco, or even Tylenol. However, it’s not true. The AKA actually hired a toxicologist who reviewed the cases and found that there was no evidence to support the assertion and that most, if not all, of the deaths may have been tied to other drug use. How, exactly, does declaring the highly beneficial Kratom plant, shown to be magnitudes safer than synthetic pharmaceutical opioids and heroin, as having no medical value “keep people safe”? The answer is simple — it does nothing to keep people safe. However, it does keep the DEA’s masters in the pharmaceutical industry safe. However, since kratom can be grown by anyone, pharmaceutical companies can’t monopolize it — unless the government outlaws it. As the Free Thought Project pointed out, pharmaceutical companies have been studying kratom for years to create synthetic versions of its alkaloids. Below is the letter from Congress to the DEA.